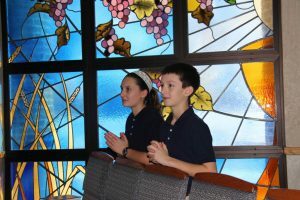 For almost 30 years, St. Mary Catholic School has provided an exemplary program for children across Livingston and Washtenaw counties. Students from pre-school through 8th grade receive an exceptional education in a nurturing and loving environment. Graduates leave St. Mary with a strong foundation of knowledge, faith, and a way of interacting in the world with confidence and compassion. With small classrooms averaging 15 students, each student receives individual attention. 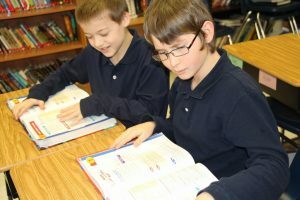 The academic program at St. Mary incorporates higher levels of thinking, and our students enjoy a stimulating curriculum that fosters a lifelong love of learning. St. Mary Catholic School is so much more than a school. It is a unified, faith-filled community working together to support one another, and especially our children. There is no way to measure the value of an education deeply rooted in faith and values. 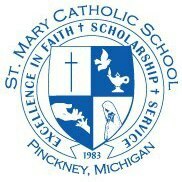 A St. Mary education truly provides the foundation for high school, life, and beyond. The St. Mary Catholic School Latchkey Program is provided as a resource to assist working parents with childcare before and/or after school and provides activities for the children in a safe secure environment. This program is available during the school year while school is in session. Latchkey does not operate on non-school days (closed on weekends, holidays, snow days, Christmas and Easter break, etc.) Two sessions will be offered: Session I is 6:45am – until school starts Session II is 3:25pm – 6:00pm. Children must pre-register for latchkey. A $20 registration fee per family for the school year is due at the time of registration. Registration forms and emergency cards, along with the parent assurance of health & immunization form, must be completed prior to attending. See rate sheet for current fees. Fees are to be paid on a weekly or monthly basis and are due along with the schedule. By registering in this program, you are reserving space, staff and other resources for your child. Therefore, once a schedule is set for the week, missed days regardless of the reason cannot be refunded or credited. The latchkey program ends at 6:00pm and the staff is not scheduled beyond this time. A $10 fee will be charged per quarter hour or any part of that quarter hour that a child remains beyond 6pm. The fee must be paid directly to the staff person and is not included in the latchkey fee. Parents must personally sign their child(ren) in and out of the program each day they attend (children may not sign themselves in and out). Medication shall be given only with prior written permission from the parent. The Latchkey program will follow the same policy as stated in the school handbook with regard to medication, a child who becomes ill or injured, dress code and discipline. Changes must be in writing to adjust schedules that have been submitted for multiple weeks in advance. Credit cannot be given for changes made in the current week. Parents should contact the program coordinator if your child is going to be absent. Parents will need to provide a snack for their child who is enrolled in either session. We participate in the SMART Tuition program. Click here for enrollment information. St. Mary provides a safe school enviornment for my kids. Felt school was warm and inviting. Mrs. Kinsey is a strong principal, and you can tell she loves her job and the school kids. Classrooms were very organized and felt like a great learning environment. Library was well stocked and very inviting. Computer lab and smart board technology were a big draw. Felt strong sense of community among the parish and school families. K-8 Tuition 2018-2019 Please call the school office for up to date information. 734-878-5616.